What would you say to a robotic drummer? A violin that channels Jimi Hendrix? Video game heavy metal? Melodic theremin? 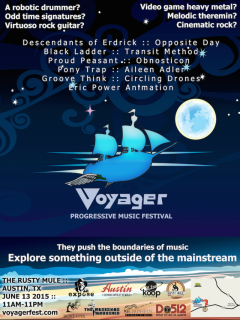 You eill find wonders like these and more at the Voyager Music Festival. This event celebrates all forms of art that attempt to go "beyond the boundaries" and create something new, with an emphasis on progressive music. $7-$15; Admission is free for children 5 and under.